Win an Ipod Nano! Help an Awesome Charity! THANK YOU TO EVERYONE WHO DONATED! TOGETHER, THE CUPID UNDIE RUN RAISED OVER $1 MILLION NATIONWIDE! AND CONGRATS TO SIMON B, THE WINNER OF THE IPOD NANO!! Hello everyone! It’s almost that time of year again! For the past couple years, I’ve participated in the Cupid Undie Run. It’s an event where we all raise money to fight neurofibromatosis (NF). NF is a genetic disorder that causes painful tumors to grow throughout the body, often on children and adolescents. How do we raise awareness and fight this disorder? By stripping down to our underwear to run in the freezing cold! That’s me! And that’s how I run. Now, The Cupid Undie Run offers various prizes to fundraisers in order to encourage our participation. 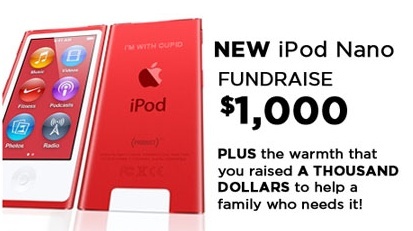 One such prize for raising $1,000 is a brand new, red, special edition Ipod Nano! I’m giving it to one of you! It’s simple – for every $10 you donate to my Cupid Undie Run page, you get one entry to win the Red Ipod Nano. Donate $20? You get two chances! Donate $50? You get five chances! Donate $1,000? If you’re the first one, then the contest ends and you automatically get the Ipod Nano! If no one donates $1,000 in one lump sum (therefore instantly ending the contest), then on February 10th, 2013, a winner will be chosen at random from all eligible participants. I will then personally pay out of my own wallet to ship you your Ipod. Now, the catch – if I don’t raise $1,000 by Saturday, February 9th, 2013 – then there is no Ipod Nano to give away! There is no contest! So it benefits you (and all the children who are suffering from neurofibromatosis) to give from the heart so we can reach our goals this year. Here’s my donation site again. Thank you very much for your kindness and generosity! 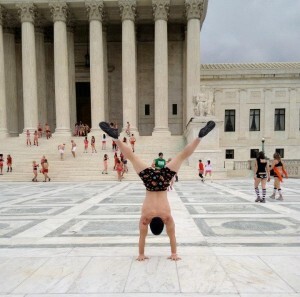 Handstand in front of the Capitol Building! But isn’t that the Supreme Court? 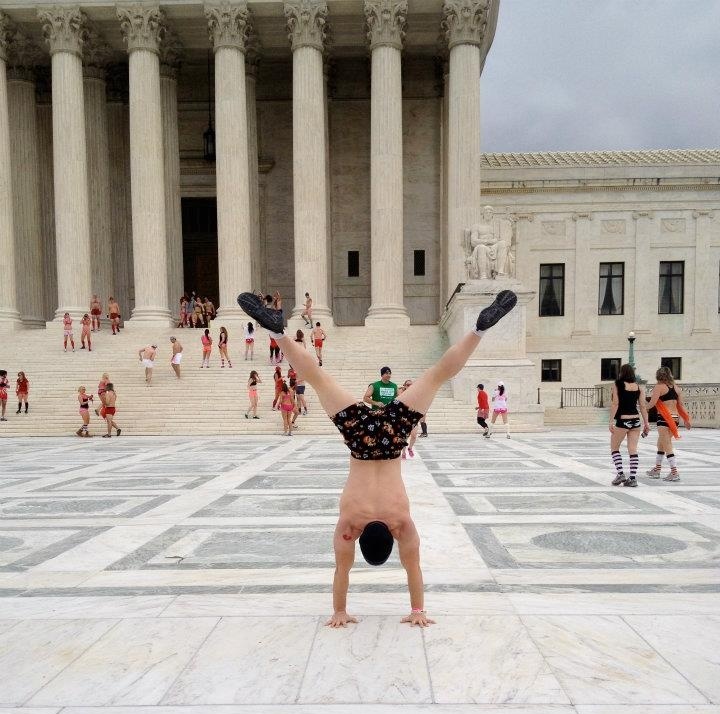 Nice handstand, in any case! (apologies if this is a repetitive message — not sure the last one went). I live in DC, and have no idea what half the buildings are.